Today I have finally decided to start my food blog. While there are people who eat to live, I live to eat. I believe in quality food, and tend to make a lot of them myself as I find eating out a bit too unhealthy or a bit too painful in the pocket and I do hope you would enjoy taking part of this food journey as much as I will. I have long battled on how to start my blog. Though I have too much recipes to share, I feel that a blog opener must be something simple, easy yet special. Something comforting. Today, food for me is homemade california maki. 1. Prepare the Sushi Rice by dissolving sugar and salt in the vinegar; and mixing vinegar mixture to the cooled cooked Japanese Rice. Make sure the rice is no longer hot, and best if it was lightly dispersed with a wooden spatula to let release the steam right after cooking. Set aside. 2. Cut up the mangoes and cucumber. Prepare the crabstick by peeling the protective plastic. 3. 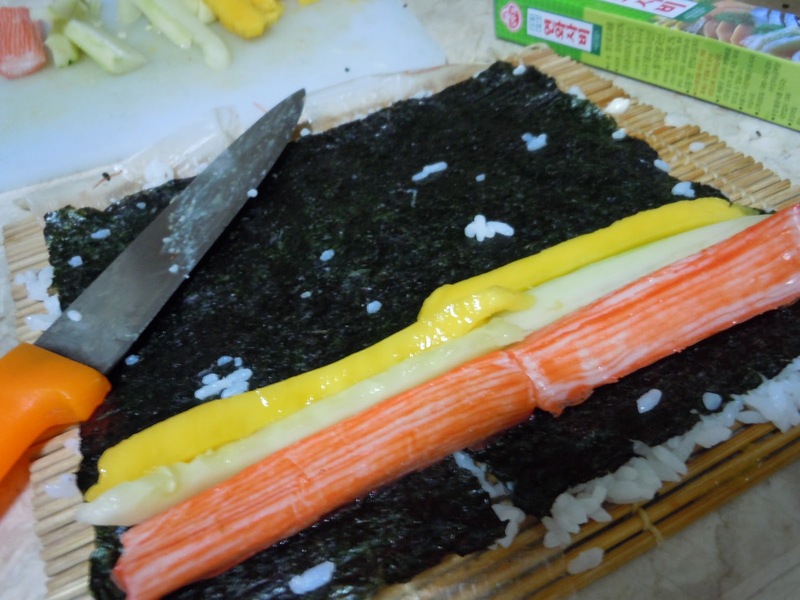 Lay 1 sheet of nori in your bamboo mat. 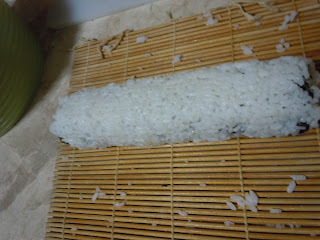 Add 1 cup of rice and press to the nori sheet, making sure you fill out the edges without going over. 4. 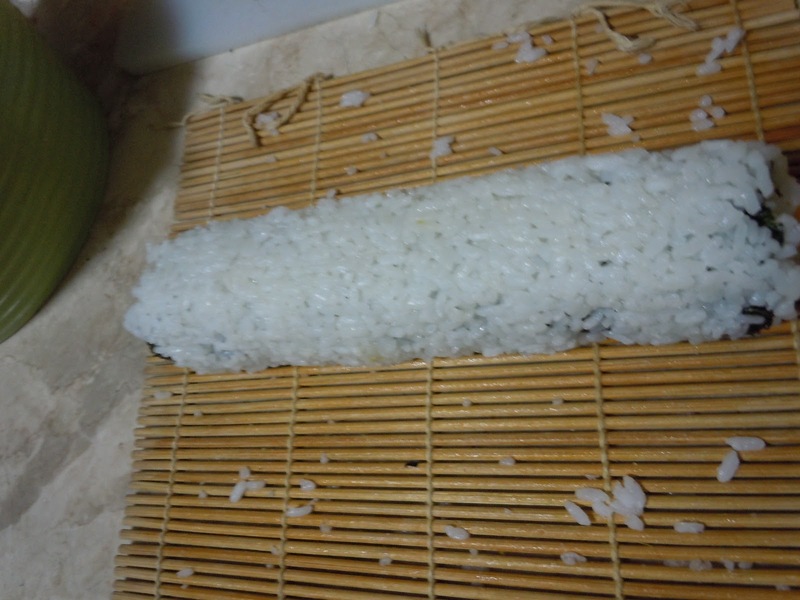 Carefully lift the nori sheet and flip upside down (making the rice on the bottom). A trick that I do here after flipping and before laying the rice back is to layer the bamboo mat with plastic so that the rice doesn't stick to the bamboo mat as much. 5. 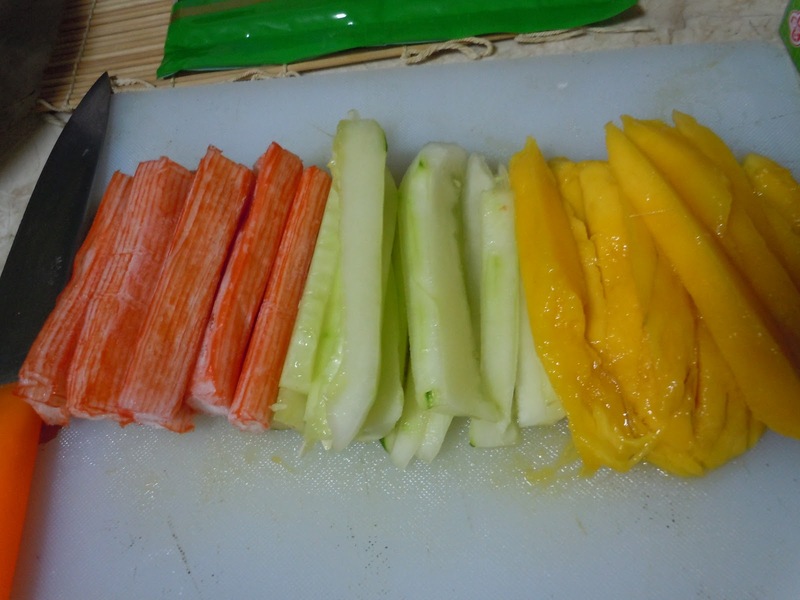 Add your cucumber, mango and crabstick on the lower bottom portion only. May add japanese mayonnaise if you wish. (not required). 6. Roll tightly, making sure it forms a square on each turn. Squeeze to tighten, but still making sure that the fillings don't ooze out. 7. 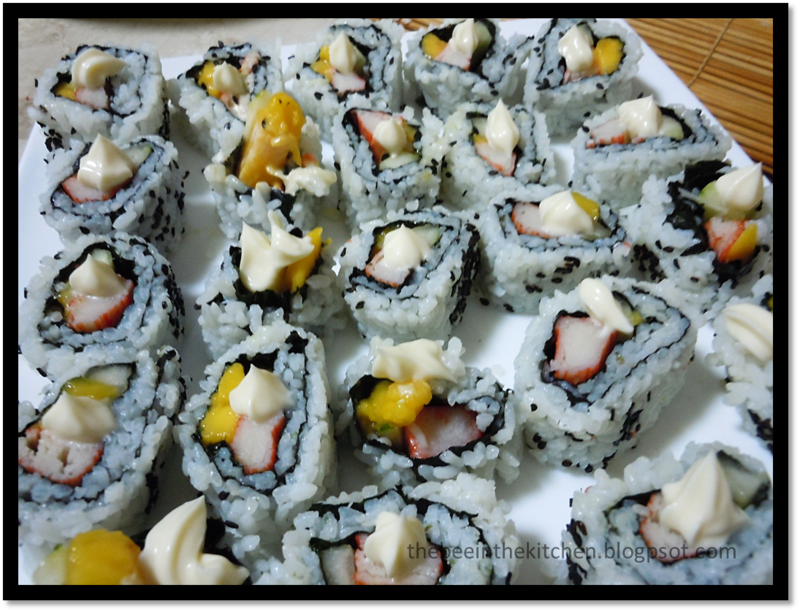 Roll into black sesame seeds or tobiko. Place roll on chopping board and cut to 8 equal pcs. (trick is to divide to 2 first, then divide again). *Try rinsing knife with water every few times for smoother slicing as the sticky rice tends to leave residue on the knife making it more difficult to cut smoothly. *disclaimer: Though much research went into my sushi making both in the kitchen and in the books, this recipe is original. There might be adaptations from various sources that unfortunately, as of the moment, I could no longer recall. Hi david! great idea on the cling wrap. and yes, omg hate it when the rice sticks to the bamboo mat. At syempre, mali pa ang spelling ko ng Abbey, hahaha. -1/2 cup dashi soup stock or water (you can buy dashi powder from any japanese store, Last time, pati Rustans, meron. -katsuobushi (dried bonito flakes); A MUST. Bale mix everything lang, except for the toppings and the bacon.. The batter should be pretty thick and not too runny, and the mixture should not be drowning in batter. Just enough to make the shredded cabbage stick. Balance na lang the flour and water. You can add whatever you want into the mix din pala. Yakisoba, seafood, sausages, cheese. I know. Yeah, super busy, but I have a ton of recipes, pics, and food trips documented. Pinapagalitan na nga ako ng mga kasama ko eh, hahaha. One day, I'll get to post them all, haha. Congrats on the start of your new blog! Looks like your blog is off to a great start! Congrats!! !